Radiator Blog: Convo and "what do simulations simulate?" Convo and "what do simulations simulate?" 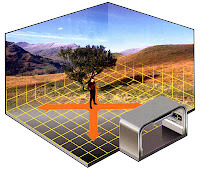 Simulations are simplified systems that have some semblance to the real world. The decrease in complexity, the ways in which the simulation is different from the actual thing, is called the "simulation gap." In games, I argue that players never forget they're playing a game or simulation, but they're willing to suspend their disbelief and ignore the gap to enjoy themselves more. I think the term "immersion" in the sense of "forgetting you're playing a game", then, mischaracterizes this dynamic and implies the simulation is all-encompassing and consumes the player, when really, it's important that games are NOT holodecks and it's a good thing that they aren't. As designers, one of our jobs is to "sell the simulation gap" and make it an asset instead of a liability. Dishonored simulates being a "magic ninja in steampunk London" -- when you accept that premise, you internalize the scope of that simulation and roleplay as a magic ninja. You're not going to try to go shopping for hats or try to take a shower, because magic ninjas are all about manly grunting and being smelly. The gap between being a person and being a game character becomes irrelevant. Similarly, The Sims "sells the gap" by emphasizing its doll-house conceit. If a Sim does something stupid, it's because it's a Sim -- they do stupid things, it's in their nature. All that silly frame fiction, of the green floating diamonds and houses dropping out of the sky and Sims waving at the camera, it's actually really important. Sims aren't people. That's why I think the "romantic comedy" aspect is really important for Convo. If I frame the game as simulating "what young people do at dive bars," player expectations of complexity and subtlety suddenly explode. I remember one guy started telling me that the gameplay should focus on getting phone numbers, being coy and flirty with your texts, waiting 1-3 days before replying, etc. Someone else started telling me about fending off creepy guys. Another expects a robust simulation of getting drunk and the camera view slowing down. Suddenly I have to simulate 50 different experiences of what going out feels like, and if I don't, then it's disappointing and incomplete. So maybe Convo shouldn't just simulate bars: it must specifically simulate the cynically-sappy Hollywood holiday ensemble romantic comedy version of a bar. Now I can impose 5 act structure on a campaign mode, force every campaign to end with a wedding, make everyone beautiful and middle class, and only the main character will have any semblance of a family. Texting becomes a convenient plot device, not a mode of communication. And when characters talk, they can only discuss 4 topics: the holidays, love, the subway, or themselves. ... Which means I'm now rejecting a "Jersey Shore reality show" simulation frame because, really, it's too structureless. Every episode's narrative emphasizes the total lack of meaning in their lives. They never have character arcs because these people never change. You don't watch that show to see growth, you watch that show to assure yourself of your own personhood. While I'm sure there's a top-down squad strategy game in engineering outbursts and humiliating breakdowns in front of camera crews, that game will have to wait, for now.